JENIN (Ma’an) — Palestinian prisoner Khader Adnan entered his 39th day on hunger strike Friday as his health continues to deteriorate, the Palestinian Prisoners’ Center for Studies said. Rafat Hamduna, director of the center, said that Adnan’s weight was dropping to dangerous levels and he is no longer able to stand up or move.The director called on Palestinian, Arab and international actors to take notice and support Adnan’s cause, adding that the detainee is defending the humanitarian rights of the 500 or so Palestinians being held under in Israeli administrative detention.Adnan, a father of six children, was detained on July 8, 2014 and sentenced to administrative detention for the 10th time in his life.Palestinians held in administrative detention can be held without charge or trial for months or years, and are denied access to the evidence that led to their detention.In an open letter released last month, Adnan wrote that the goal of his strike is to resist Israel and prevent it from tarnishing the achievement of prisoners who secured their freedom by going on hunger strikes in the past, only to be rearrested by military forces. He announced his strike on May 6 to the Muhjat al-Quds foundation, however rights organizations have given conflicting reports of the exact start date.In 2012, Adnan took part in a 66-day hunger strike against his detention without trial or charge. The agreement that released him on April 18 of that year also ended a hunger strike of 2,000 Palestinian prisoners, who had called for an end to administrative detention.Despite Israel’s agreement to the demand at the time, around 500 Palestinians are currently being held under administrative detention, out of a total of nearly 6,000 Palestinians being held in Israeli prisons. The 22nd General Assembly meeting opened today in Istanbul. On top of the agenda of the meeting are reviewing the political developments including the results of the meeting with the UN envoy Staffan de Mistura. The meeting will also discuss restructuring the Syrian Coalition, civil administration in the liberated areas, interim governance, field and military developments. Vice-president Hisham Marwa renews the Syrian Coalition’s commitment to the principles and aspirations of the Syrian Revolution and stresses the priority of a political solution that ensures achieving those aspirations, most importantly the departure of Assad and all perpetrators of war crimes. Marwa reaffirms the Syrian Coalition’s respect for the revolution’s principles and goals of making a transition to a civilian pluralist democratic state that is based on the principle of citizenship, recognizes equal rights of all components of the Syrian society and, and respects human rights and all other international charters and conventions. The Israeli Police released, late Thursday night, three Palestinian children from Silwan neighborhood, in occupied East Jerusalem, after detaining and interrogating them for several hours, allegedly for throwing stones at a settler’s car. The Wadi Hilweh Information Center in Silwan (Silwanic) said a settlement guard detained three children in the al-‘Ein area in Silwan, before he contacted the police who later arrived and took them to a police station. 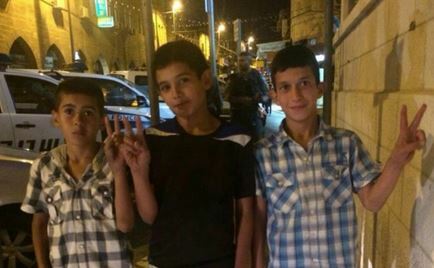 The three children have been identified as Ahmad ‘Ezz Shweiki, 10, Tamer Mazen Shweiki, 12, and ‘Odai Nidal ar-Rajabi, 13 years of age; they were moved to the Police Station in Salaheddin Street. Friends of the detained children informed their families, and when the parents went to the police station, they were not allowed to see their sons, or attend the interrogation. The families were forced out of the station and were ordered to leave the entire area, or face imprisonment. Silwanic said the police interrogated the children without any legal representation. Their parents were finally allowed to see them four hours later, after the interrogation was concluded. During interrogation, the children were not even allowed to drink water, or use the toilets, and the interrogators were shouting at them. Hours into interrogation, the youngest child was allowed to drink some water. After their release, the children said a settler stopped them while walking in the al-‘Ein Street, and claimed that he had seen them throwing stones earlier, and that he had a video of them throwing stones. The Israeli extremist threatened the children, telling them they would be taken by social services, and would never be able to see their families again, Silwanic said. The children told Silwanic they demanded the police to show them the alleged video recording, but the police never presented any recording. The children were forced to sign confessions that were written in Hebrew, a language they did not understand. It is worth mentioning that Israeli soldiers have kidnapped twenty children, including two between 12 and 14 years of age, in occupied Jerusalem since the beginning of this month. Preventing parents from being present at the interrogation of their children violates both international. A lawyer with Silwanic said the army is even acting in violation of Israeli law by holding and interrogating children without any legal representation, and without the presence of social workers. He said the law bars the interrogation of children without legal representation and without informing social services. In addition, under Israeli law, interrogators are not allowed to question children without the presence of a specialized detective, and all interrogations are supposed to be recorded. The lawyer added that Israeli law also instructs the police to inform the parent directly after arresting their children, and to hand them a legal copy of the arrest warrant in addition to informing them of the location where the child is being held. He also said the interrogators cannot question children without the presence of at least one parent, but the Israeli police and army continue to violate this and other laws. The history of US military involvement in Iraq has led to increasing anti-American sentiment in the region and laid the foundation for the rise of terrorist groups like ISIL, according to a writer and professor in Binghamton, New York. “The US has to disentangle itself from Iraq instead of fomenting more opposition by sending in troops,” said James Petras, a retired professor of sociology at Binghamton University. His comments follow the Obama administration’s decision to send an additional 450 military personnel to Iraq to support Iraqi security forces battling ISIL militants. US General Martin Dempsey, chairman of the Joint Chiefs of Staff, said Thursday that the Pentagon is considering establishing additional military bases in Iraq. The top general said a new military base, being established in Anbar Province, could be a model for more such US military hubs across Iraq. However, recent setbacks in Iraq and Syria have raised serious doubts about President Barack Obama’s strategy against the terrorists. “The problem is not the lack of US troops; the problem is the history of US military involvement in Iraq which caused over 1 million deaths and uprooted millions of people,” Petras told Press TV on Monday. At the G7 summit in Germany earlier in the week, Obama said that his administration does not yet have “a complete strategy” against the ISIL terrorists. Obama’s admission came nearly 10 months after he ordered an open-ended military air campaign against the Takfiri group. “The fact that Obama doesn’t have an overall strategy is because the strategy that they’ve used for the last decade and a half hasn’t worked and simply making it more extensive and deepening the US presence is not a new strategy, but a continuation of a failed, past strategy,” Petras noted. The United States has spent more than $2.7 billion on war on ISIL, averaging more than $9 million a day, according to the Pentagon. What does it mean when the most prominent platform for Israeli strategic thinking is discussing the issue of “Islam in Europe” as part of its list of “strategic threats”? The events of this week’s 15th Herzliya Conference give us an impression of the trends dominating the thoughts of those drafting Israeli strategies. On Monday, the conference held a discussion titled “Islam and BDS in Europe: A Strategic Threat”. For Islam and the Boycott, Divestment and Sanctions (BDS) campaign to be classified as a threat to Israel’s interests in Europe, it means that the nervous officials in Benjamin Netanyahu’s government believe that they have to launch a fierce campaign to incite people against this growing trend in global civil society. Observers are left to guess the form in which the new incitement campaigns will be launched against Islam in Europe. There has already been heavy defamatory propaganda by pro-Israel lobby groups for years against Muslims and pro-Palestinian activism. Considering Islam in Europe as a strategic threat to Israeli interests, in the naïve manner witnessed in the Herzliya Conference programme, perhaps helps us to understand some of the political alignments occurring over the past five years. The far-right in Europe, its radical parties and populist leaders, have made a historical reconciliation with Israel. Israeli officials have welcomed numerous party leaders who are accused of being anti-Semitic. Some have even expressed their understanding of the construction of illegal settlements in the occupied West Bank, while others even wore the Israeli army uniform when on the borders of the large prison called the Gaza Strip. As a result of this reconciliation, a mutual political discourse was formed which conveyed the message that Israel is defending Europe and Western civilisation against Islam. We can assume, therefore, that certain Israeli trends have found an opportunity to emerge in light of the great fear in Europe over extremist groups, especially ISIS. These trends are now presenting themselves as allies of the West in this “clash of civilisations”. Of course, this is at the expense of the Palestinians’ inalienable rights. There are important details to consider in this regard. For example, during Israel’s attack on Gaza last summer, its propaganda justified the heinous acts committed by the Israeli army against Palestinian civilians on the basis of fighting “radical Islam”. The Palestinians in the enclave and ISIS, which emerged from Iraq and Syria, were grouped together. On a number of occasions, Israeli diplomats distributed materials that were anti-Islam and anti-Muslim before withdrawing them hastily when challenged by protests in Ireland and Sweden, among others. After the Charlie Hebdo incident in Paris, senior Israeli officials’ words matched those of the far right-wing in Europe. The Israeli government, which involved itself in the aftermath of the incident, gave the impression that it was seeking to incite Europe against its Muslim citizens by means of their statements and clear implications. What needs to be said is that these “strategic” trends are not doing Europe any favours. Instead, they are counting on splitting the ranks within Europe’s multi-ethnic and multi-religious communities and spreading hatred therein. This has been adopted by Israel’s new allies on the far-right who are professionals at provoking panic in order to gain votes. Instead of classifying the Muslims in Europe as a strategic threat, the Israeli strategists and their friends around the world who attended the Herzliya Conference should have looked into the consequences of following such a radical right-wing ideology, as the Israeli government currently does, even when this contradicts the logic of history. QALQILIYA (Ma’an) — Five Palestinians were injured, two critically, when Israelis forces opened live fire on the Kafr Qaddum weekly march Friday.A coordinator for the village’s popular resistance committee, Murad Shtewi, said that Muhammad Majid, 20, had been shot in the stomach and chest with live rounds and is in critical condition.Ibrahim Mousa, 35, is also in critical condition after he was shot in the abdomen while in his house.Shtewi also said that Muhammad Nidal, 20, and Mouiz Khader had been shot in the leg, and Ayman Farouq, 38, in the hand.Dozens others suffered from excessive tear gas inhalation.Israeli forces had closed down the village’s entrance since the early morning after they declared it a closed military zone. As a result, those injured had to be evacuated from the village in private cars using dirt roads.An Israeli army spokeswoman contacted by Ma’an said she would look into it.Israeli forces routinely suppress weekly marches by violent means.In Kafr Qaddum, they also regularly declare the village a closed military zone in order to prevent the weekly march from taking place.The march is carried out to protest the Israeli separation wall and Israeli settlement activity, both illegal under international law.The internationally recognized Palestinian territories of which the West Bank and East Jerusalem form a part have been occupied by the Israeli military since 1967. Thousands of Bahrainis took to streets today chanting angry slogans ahead of the judgement session of Sheikh Ali Salman, the opposition leader and Secretary General of Al Wefaq National Islamic Society. A number of large protests marched several villages across the country, whilst Duraz, west of Manama, saw the largest protest which followed the Friday central prayer. The protesters raised pictures of Sheikh Ali Salman denouncing his trial and demanding his immediate release. Leading clerics in Bahrain issued a joint statement on Wednesday calling for wide demonstrations to call for Salman’s release and acquittal. The peaceful protests were faced with suffocating tear gas by security forces. TUNIS: An armed group stormed the Tunisian consulate in the Libyan capital Tripoli and kidnapped 10 staff on Friday, the Tunisian Foreign Ministry said. Tunisia is one of only a few countries which still has a mission in Tripoli, a city which is controlled by a group that has set up its own government, a rival to Libya’s internationally recognized leaders. Tunisian authorities last month arrested Walid Kalib, a member of that rival group, Libya Dawn. On Thursday, a Tunisian court refused to release Kalib who faces kidnapping charges in Tunisia. Libya Dawn, a loose alliance of former rebel brigades and Islamist-leaning groups, seized power in Tripoli last summer, expelling the internationally recognized government to the east. Most countries closed their embassies during the fighting. Relations between the North African neighbors have become increasingly tense, with Tunisia’s government worried about spillover from the chaos that continues to plague Libya four years after the overthrow of strongman Moammar Gaddafi. The Islamic State of Iraq and Syria (ISIS) group has reportedly survived close to 4,500 air strikes by the U.S.-led coalition since it proclaimed itself as a “worldwide caliphate” in June last year. But the militant group remains a formidable fighting force and continues to lure foreign fighters through its masterful use of media tools. The group overran Mosul – a city of two million – on June 10, 2015, leading to the displacement of hundreds of thousands of Iraqis. Beyond its well-edited, subtitled, HD-quality films, and its notorious English-language magazine, Dabeq, ISIS has also been using another avenue to up its propaganda game: radio. “We thank our listeners for tuning in and present the following Islamic State news bulletin.” This is how listeners are greeted when they tune into “Al-Bayan” radio network, which kicked off in Mosul on April 7 in the Arabic, Kurdish, English, French and Russian languages. The professional tone of the anchor and sound quality of the broadcast prompted news outlets such as The Washington Post to liken it to the National Public Radio (NPR). “The language is broadcast radio. It sounds like we are listening to the BBC,” Jasmine Opperman, a senior analyst for the Terrorism Research & Analysis Consortium (TRAC), told Al Arabiya News. “They are diversifying their central message of success on the battlefield,” said Opperman. 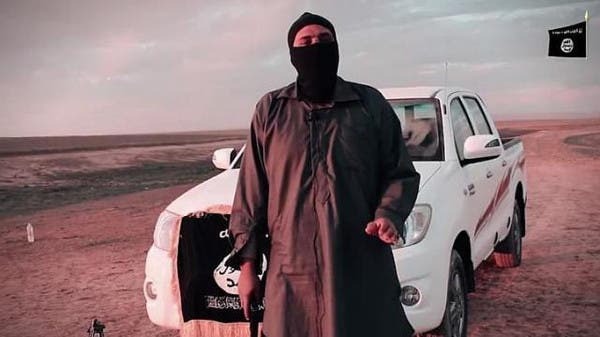 “ISIS would not launch a propaganda campaign like this if it did not have a target audience in mind,” said Opperman. ISIS’s use of media is an attempt to “promote its soft power,” William Youmans, a professor of media and public affairs at the George Washington University, told Al Arabiya News. “As ISIS seeks to become an established state, it knows it must seek legitimacy, and that it cannot just rule on violence, even if that is how it gains territory and represses people living under its rule,” Opperman said. “In terms of its efficacy in recruiting foreign fighters, their media production must be somewhat effective as they continue to invest in it and are becoming more sophisticated,” he added. The films often focus on family life, social values and a broad range of topics such as schooling aiming to attract Western audiences. “ISIS has a big incentive to show itself as friendly to families and generous in welfare to undermine the images of its brutality. It would want to widen the tent of people it could attract,” explained Youmans. Al Bayan’s newscasts, in contrast, sound a lot more serious and rather focus on updates from the battlefield. Even when announcing the name of a suicide bomber on the program, the news anchor tone remains calm – a departure from the usual “sensationalization” of ISIS “martyr” deaths usually witnessed in videos. “It is possible this reflects ISIS’s media savvy. The people who work on media likely have a sense of how audience breaks down per each medium, and try to tailor the messages based on who they think they are more likely to get,” he added. The 24-hour updates on “the successes and gains” are an attempt by ISIS “to explain to the people in the caliphate to rest assured that ‘we are in control, we are making gains, we are not being defeated by any opposing force’,” said the analyst. “The language is and has definitely changed but it is not an opposition at all to the existing propaganda campaign,” she added. “ISIS is focused on the perfect caliphate. A caliphate where we have a perfect life with children playing in the parks, we do have schools, we do have women walking with their husbands and the child so happy’,” she said. “But ISIS has never fell back on showing its successes and brutality. Why not? Simply because, we need to keep in mind their ultimate goal, they are fighting a righteous cause,” said Opperman, adding that the groups built a logic behind the executions and human rights abuses they are doing. “’We are doing these things to ensure that the Islamic Caliphate will be achieved and that the values we are putting on the table will be protected from sinners and believers’,” she said, explaining the group’s ideology. “There is no contradiction. ISIS never hides behind or try to diminish their role in executions, their role in the punishment of the infidels,” she continued. Although it is difficult to scale the outreach of Al-Bayan’s newscasts, since it is mainly circulated via social media sites and jihadi websites but experts agree that ISIS’ tech-savvy media productions have been key in its recruitment game. An estimate of 1,000 foreign fighters are flocking into Syria and Iraq a month, according to a recent Foreign Policy report – to world leaders’ worry. “Daesh is coming, if it can, for every person and for every government with a simple message: ‘Submit or die’,” Abbott said, using ISIS’ Arabic acronym. In Gaza, Medical Aid for Palestinians supports the Ard el Insan malnutrition clinic, on a project which provides care and treatment for malnourished children under the age of three who are living in extreme poverty and insecurity. Appalling facts and figures, such as almost of 10 per cent of under-fives suffering from stunting (chronic malnutrition) and an increase in wasting (acute malnutrition) from 1.4 per cent in 2000 to 3.8 per cent in 2014, show how urgent such support is to the health of Gaza’s beleaguered children. Over the course of the last year, this project, generously funded by our supporters, has sought to assess the nutritional health status of more than 1,000 children 6-36 months, and to provide treatment to 300 children identified as suffering from wasting, growth faltering and anaemia. It has also aimed to improve the quality of life and wellbeing of 500 coeliac children and adult cases. The success of this project means we will be continuing to support it for the foreseeable future. You can help us continue this vital work by donating to MAP here.